The easiest way is to download our free Drupal online booking module from here and then upload the "freetobook_widget.tar.gz" file via the modules/install page. Use the choose file button to select the file you have downloaded then click install. Other methods, including manual uploads, are detailed in this section of the Drupal manual. Once installed you will need to enable the widget from the modules menu, to do this simply tick the "enabled" checkbox for the freetobook widget and then click save. Once enabled you should configure the widget by adding the unique widget key for your propery. 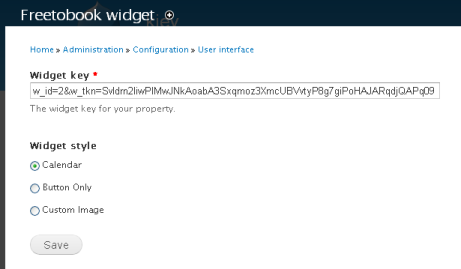 Go to the configuration menu and select "freetobook widget" from the user interface sub-section. Enter your key in the box and the click save. The widget is now ready to be placed on the site. 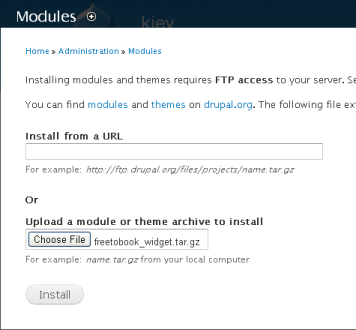 The placement of the widget is controlled through Drupal's block configuration page. Select "structure" then "blocks" from the admin menu. The freetobook widget will be listed at the bottom in the disabled section. Select where you want the widget to appear from the drop down list and click save. That's it! You should now have an online booking engine installed on your Drupal site.